SATURDAY: The Yankees have issued a press release announcing Kuroda's re-signing. FRIDAY: The Yankees and Hiroki Kuroda finalized a one-year, $16MM contract last night that will allow the right-hander to earn up to $500K worth of incentives, according to Joel Sherman of the New York Post (on Twitter). Kuroda, a client of Octagon's Steve Hilliard, will earn $250K for reaching the 190-inning and 210-inning milestones, according to Sherman. Kuroda will turn 39 years old in February and was reported to be weighing a return to Japan or a return to a Southern California team in order to be closer to his family, who currently reside in that area due to Kuroda's days with the Dodgers. Kuroda turned down a qualifying offer from the Yankees in November, getting tagged with the potential cost of a draft pick had he signed with a different MLB team. Instead, Kuroda will return to New York for a third season. Over the past two years, Kuroda has posted a 3.31 ERA with 6.8 K/9 and 2.0 BB/9 in 421 innings in Yankee pinstripes. Kuroda earned $15MM in 2013, so a $16MM salary represents a slight raise, as predicted in MLBTR's September free agent profile. 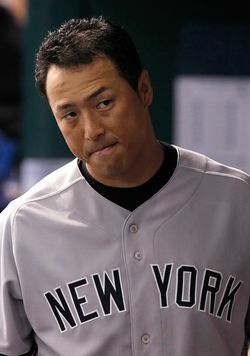 The Kuroda signing restores some much-needed depth to the Yankees' rotation, which had only C.C. Sabathia and Ivan Nova penciled in. With Robinson Cano agreeing to a contract with the Mariners today, the Yankees are now flush with payroll flexibility to bid on the best remaining starters. Masahiro Tanaka will likely be the top target if posted, while traditional free agents Ervin Santana, Matt Garza, and Ubaldo Jimenez remain on the board. The Yankees have already committed $254MM to free agent position players this offseason, most notably $153MM to Jacoby Ellsbury and $85MM to Brian McCann.